In a mizzling rain that brings darkness to the red heartstone of the city, I set out to meet David Kinloch to interview him about his Ars Poetica in light of his recent publication In Search of Dustie-Fute, shortlisted only this morning for the Saltire Poetry Prize. We have arranged to meet in “Tinderbox”, Ingram Street, an artisanal coffee house in Glasgow’s Merchant City. The last time I saw David was by chance ten years ago in the same coffee house when, as a probationary teacher of English, my need for an inspired approach to teaching creative writing to a class of recalcitrant third years had failed to levitate from my espresso cup, he offered me some leavening thoughts of his own for capturing their attention. Today, the territories are marked-out differently with me now a student on a creative writing programme and he, of course, a published poet of no fewer than six collections and the Professor of Creative Writing at Strathclyde University. However, any anxieties about the shift and the division of territories brought by the intervening years are bridged by the shaking of our hands. People often ask me who are you writing for and for a long time I probably lied through my teeth and described this ideal audience that I had in mind but in fact you write for yourself to get a bit of obsession down on paper to frame things. To provide a kind of framework that will clarify things for you in a memorable way. And, the next stage is trying to find some way of making it appealing to others. At the crossing on Cathedral Street linking the two University sites, David deliberates over his Oxford years and the influences of Robert Crawford, Henry Hart, and WN (Bill) Herbert who, like him, were poets and PhD students. Bill Herbert, the Dundee Makar, ran a poetry writing group there between 1979-82 where they would read, exchange, and workshop each other’s poems. Being Scottish is what linked them together: a sort of group ambition of coming back to Scotland to write, teach, and publish their poetry. In short, there was at that time a group of Scottish poets in Oxford for whom the idea of Scotland and Scottish poetry was really quite important; and, being in Oxford, in a kind of exile, reinforced David’s sense of Scottish-ness. He began to perceive his own country’s culture more clearly because of this distance between himself and Scotland. Richard Price, a great friend and influential figure on the literary scene in Oxford, and who latterly became an editor of Verse before starting up a little press called Vennel Press, published part of what was to become his first book of poems in pamphlet form called Dustie-Fute in 1991. You know, I was teaching class the other day on dialogue to first year students and I was explaining to them that the dialogue you put into short stories is always a selection. It has to have a spontaneity of everyday speech but it’s not a chunk of everyday speech because everyday speech is all over the place. It can be very boring and so you have to be very selective about what you choose. 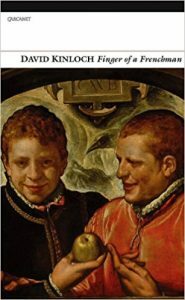 My poetry reflects and selects from some of my interests and expressions and aspects of my personality rarely in a direct way…so, yes, of course David Kinloch is in the poetry… but, it’s not the same person. It’s a version. He is continually experimenting with ideas of the self and exploring different aspects of what you might take to be your own self; yet, the self is such an amorphous concept and difficult to pin down. He stresses that the poet can be extravagant and experimental in the poetic domain but not in their own personal life. Poetry for him might be a sort of escape but also a way of framing the experiences of life in an interesting way. In a recent BBC arts programme about Charles Causley, the Cornish poet said that he’d “burst” if he couldn’t write. David’s need is more measured and controlled but he wishes, rather wistfully, that it was less under control. If he felt that bursting need to write every morning then he couldn’t also be an academic. Yet, his academic job is important to him and does afford him the opportunities to write scholarly pieces on Scottish topics and also to publish as a poet, with all of that poetry classified as research. He has, like Causley, who was also a teacher, an outlet for his creativity. His involvement with the Scottish Writers Centre, based in Glasgow, came about because he and others felt a kind of gap was opening up between University creative writing and the kind of creative writing one would find in the community. He feels that there is a kind of “creeping professionalisation” of creative writing that has come about because of the academy and although he is very much part of the academy, it is also something he is concerned about: he wants people no matter what their background, their class or their financial means, to have access to “good writers, workshopping, and creativity”. 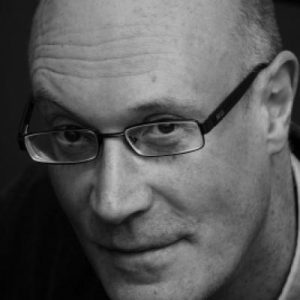 David feels that, as both a writer and a teacher, he is in the invaluable position to offer practical assistance to new writers on the basis of his own experiences. In addition, he is also a believer that “other people are a huge source of inspiration because they give you ideas you wouldn’t have been able to come up with yourself. So, it’s an exchange in that respect”. Yes, absolutely, it’s a difficult photograph to write about and when I saw it initially in the gallery I hadn’t seen it before…and I was pretty gob-smacked by it and it put everything else around it into the shade. I was troubled by it, initially, as I thought how on earth am I going to write about this and isn’t there something quite voyeuristic about writing in response to that. But, then, I suppose that photograph was to some extent about voyeurism and the objectification of gay men and so forth and so that sort of authorised me in a way to write about that particular piece…it was an important image also in that it made me realise…made me think about my own generation and my own experiences of being a gay man in Paris in the 1980s. As the essay itself says at one point, that experience of the AIDS epidemic and seeing people that you know and love cut down really forms you in a way for the rest of your life. your passport head is pinned in silk. called Isaac whose name means ‘he laughs’. The women are, perhaps, collectively speaking a feminine Orphic voice. This is analogous with Yael Farber’s biblical play Salome at the National Theatre, London, which I saw earlier this year in which the titular protagonist tells her own story about St John the Baptist only from the end rather than the beginning. 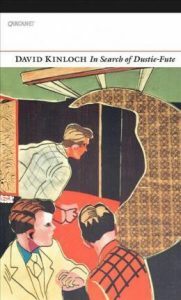 The transitioning relationship between the current and the previous collections of poetry, is all to do with an evolving ekphrasis and how to write about visual art, and David would say that this is a running theme; a strand from boyhood through to now. He hadn’t remembered that the very first poem he wrote was about the Altamira Bison cave painting until he was preparing a class on the theme of origins and it struck him that visual art has always been a constant in his life. 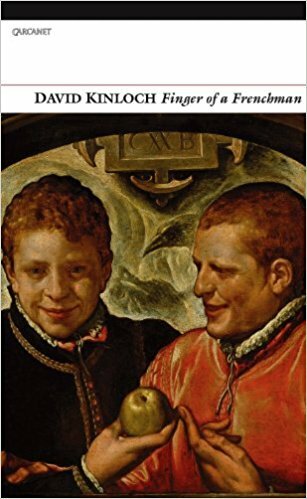 In Finger of a Frenchman, his previous poetry collection, David is essentially “telling” the story of the artist’s relationship between France and Scotland over five centuries. Since writing those poems, he has come to realise there are other ways of writing about visual art. The kind of “double-voiced” poems In Search of Dustie-Fute, that are described in relation to the Smithsonian exhibition, are a product of this change in thought-process and a way of trying to write a more sophisticated ekphrasis where the art object itself becomes a launching pad for an explanation of sexuality, gender, equality and more. Day after day after day, he keeps a diary of his visits to these two paintings and that must sound like pretty boring stuff…but, in actual, fact it’s fascinating because from time to time he stops writing prose and he moves into poetry. It was very interesting to just think about the moments when he stopped writing prose and when he started moving into a much more lyrical kind of verse and the relationship between those two approaches to what he was looking at…so, that book played a part in that process of thinking about whether it was prose or poetry that would be more effective in this particular context. Thinking about his next steps, David would be happy not to write any more poems about paintings given that most of his oeuvre is inextricably intertwined with visual art. Yet, in trying consciously to explore women’s voices, he is writing a one-woman play inspired, once again, by looking at a piece of visual art. By putting a character on stage and letting the audience hear that voice, he will also be pursuing his interests in voice and character. As far as poems are concerned, he has been trying to write, consciously, about current events, although in an oblique kind of way: “I am really interested in the terrible things we do to our planet. So, there is an eco-poem in there, too, struggling to get out. But just how do you do that?” David echoes the words of WH Auden when he says, “Poetry makes nothing happen”. Yet how much truth there is in this statement is open for public debate. I believe David’s words and the words of poets do matter, and will continue to matter, as they find their way by various means into the public consciousness. What a great piece – I enjoyed reading it. Felt I was right there with you, hanging onto his every word. Brilliant piece!